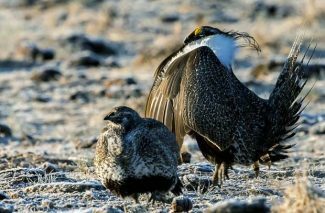 The sage grouse is currently being considered for listing under the Endangered Species Act, and Montana is the last of 11 western states to produce a plan to argue management of sage grouse should stay in state hands. Photo by Rick McEwan. New data on the Wyoming sage grouse population reveals bird numbers should continue to grow in the coming year based on an analysis of sage grouse wings provided by hunters. There were 1.7 chicks per hen in 2015, the same as 2014. This ratio is the highest documented since 2005, and more than double the recent low of 0.8 chicks per hen noted in 2012. The 10-year average, from 2005-2014, was 1.3 chicks per hen. Grouse numbers declined in most of those years. Hunters contribute to the management of sage grouse by assisting the Wyoming Game and Fish Department in the data collection through legal, regulated hunting. Wing data is gathered from hunters who voluntarily deposit wings in barrels scattered across central and southwest Wyoming. "It is good to see that sage grouse numbers are still climbing. We know populations are cyclical, and we are in a wet period that benefits sage grouse and their habitat," Tom Christiansen, sage grouse program coordinator for the Wyoming Game and Fish Department said. "We appreciate hunters who provided wings. Their participation helps us manage the bird and build on previous years' data." Generally favorable moisture patterns this past spring and summer provided better than average conditions for chick survival. During their first month of life, newly hatched sage grouse chicks rely on a high protein diet provided by insects. Spring and summer rain leads to increased grass and forb (wildflower) production which, in turn, leads to more insects available for young birds. This latest information follows earlier documentation showing an increase in sage grouse in 2014 and 2015.